THIS YEAR’S BORD Gáis Energy Irish Book Awards are due to take place on Tuesday 28 November – and there’s still plenty of time to vote for your favourite among the nominees. But if you also want to get your hands on some of the nominated books, you’ve come to the right place. 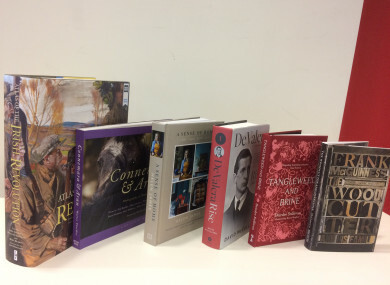 TheJournal.ie is proud to be sponsoring the Best Irish Published Book of the Year award, and we have two prizes to give away of a copy of each of the six books in the category. Ranging from fiction to history to photography, the category is a wonderfully diverse one. What date are the Bord Gáis Energy Irish Book Awards 2017 going to be held? Put ‘Irish Book Awards’ in the subject line of the email and include your name, address and contact number, so we can let you know if you’re one of the two lucky winners. Closing date is midnight on Sunday 12 November 2017. Email “COMPETITION: Win these books nominated for the Irish Book Awards ”. Feedback on “COMPETITION: Win these books nominated for the Irish Book Awards ”.